Jon Proctor is my favourite aviation photographer. His images capture their time so well, span decades, and have been published in several books I have. He also uploads images to JetPhotos.com, my second goto site after Airliners.net. The above image of a Lockheed TriStar illustrates how its centre engine was mounted. Compare that elegant S-duct and full-height rudder to the squat vertical stabaliser and awkward third engine in the DC-10. 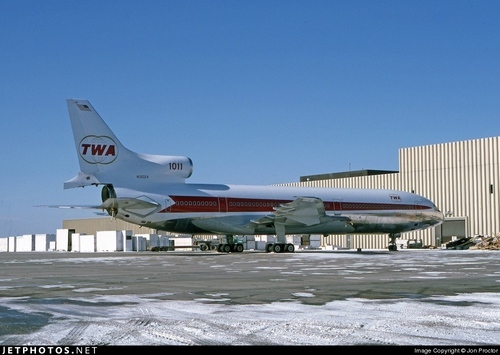 Notes: Although delivered to TWA in December 1974, N31024 did not enter service until April 30, 1975, due mainly to the oil embargo. It is seen in storage at the overhaul base, its engines removed for use as spares. Also, dig the old TWA livery. I love the arrow-like cheatline and dual-sphere logo. So much better than the followup Trans World colours.